The Fairtrade Foundation has called on the UK government to lead the way in securing £50m to invest in its work over the next five years. 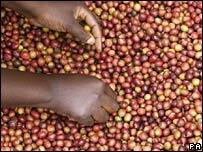 The foundation gave evidence to a House of Commons committee's inquiry into fair trade and development. Its head, Harriet Lamb, said she needed the extra money to change attitudes, so that nobody would pay a farmer less for a crop than it costs to grow it. The committee is also hearing from Starbucks and Marks & Spencer. Ms Lamb told MPs: "In the first 10 years we've shown that the concept can work: it can work for the farmers and development, it can work for the market." She was joined by the Commonwealth of Dominica's Prime Minister, Roosevelt Skerrit. Mr Skerrit spoke about the effects that Fairtrade has had on the Windward Islands' banana industry. Fairtrade guarantees a set minimum price to farmers for their products, which covers the cost of sustainable production and adds a premium to be spent on social or economic projects. UK consumers spend £300m a year on Fairtrade products including coffee, bananas and baby food. Mr Skerrit said that the growing British trend for Fairtrade bananas had reversed a nearly catastrophic recession in his country. 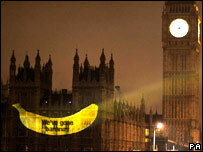 Some supermarkets, such as Waitrose and Sainsbury's, are now promising only to sell Fairtrade bananas. "The development of fair trade is critical to Dominica's development especially in regard to the banana industry," said Mr Skerrit. He said Fairtrade has been particularly important since the European Union ended his country's preferential treatment on the market following a World Trade Organization ruling.